Get your tickets for the Ultimate Burning Man Raffle! 1 GENUINE BURNING MAN TICKET!! – A personal-sized Fire Poofer that shoots 6′ flames! – Zoa T-Shirts, Zoa Stickers, and more! Posted on Friday, July 20th, 2012 at 11:02 pm. 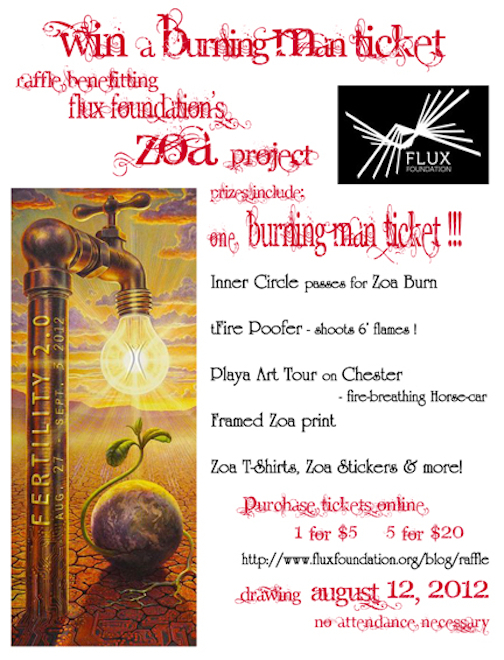 Filed under: Blog Tags: burning man, flux foundation, raffle, ticket, Zoa	RSS 2.0 feed. Best of luck! Prizes are all wonderful–hoping for a fire poofer!